There are many layers to New Old World that can be missed on first reading, so I’ve created a new discussion guide for readers who want to dig a little deeper. Questions about style and structure, as well as characters and themes, will help book groups and independent readers get more out of the novel. An updated edition of New Old World is now available at Smashwords, Apple Books, Amazon, and other retailers. This 2018 edition also includes a couple of fixed typos and a handful of changes in word choice. But the major enhancement is the reading guide. — New Old World is a novel but it often reads like Ticonderoga Fox’s memoir. In fact it is the story of Ti writing her story while still living it. How is the first chapter like the beginning of a memoir? Where else in the novel are we aware of Ti’s writing process? Consider the changes in narration as well as the passage of time. — How do the poems that bookend the novel enhance your understanding of the story, or of Virginia and Ti? In what way are they gifts from mothers to their children, and what kind of guidance do they offer? — Why did the author choose to make Ti a photographer? How does her visual nature affect the way she perceives the world, interacts with people, and conducts her life? — How does Ti exemplify the freedoms and choices that faced women of the Baby Boomer generation? Do you believe Ti ultimately found a satisfying balance of family and creativity in her life? How might things have turned out for her if she had decided against motherhood and marriage? First there were vanity presses, a pejorative term if there ever was one. Any writer with enough money could pay to have their manuscripts edited, typeset, and printed by “presses” (for-profit companies) that stroked authors’ egos to get their business—and the lion’s share of the proceeds. Then, when digital advances made it possible for authors to produce their own good-looking books on their desktops—whether on paper or as an e-book—the term self-publishing came into vogue. “Self” is a bit of an improvement over “vanity,” but not much. The biggest change was authors’ increasing control over their own material—and the bottom line. Now, just as my self-published e-book makes its way into the world, we have a new term for people like me: “indie authors.” I love it! There’s no judgment involved—it’s a completely neutral descriptor. But it has great associations from its antecedents: indie films, indie rock, indie design, etc. Indie authors are outside the mainstream, having eschewed the years-long process of finding agents and conforming to the narrow and exclusive curation of publishers who are as motivated by profit as the vanity presses. Indie authors are truly independent—of somebody else’s idea of what might sell, how a story should be told, what the cover should look like, and how an author should promote herself. Of course they may be independent of money and attention, too, which is the risk indie authors take in order to retain control of their art and their lives. But if they’re not averse to marketing (which I admit, I am), indie authors can find an audience and bring in enough to go out to dinner now and then. Promoting your self-published book can take as much time and energy as the dog-and-pony shows the big publishers send authors on. These days, publishers rely on the “branding” you’ve done for yourself, your professional and personal connections, and your physical body and soul to get your book out there. So why not do it yourself? In your own style? Perhaps, like many authors, you’re media-shy, or you don’t like to talk about your book, wanting it to speak for itself. You don’t like listening to other authors read out loud and you don’t see the point of autographs, so why would you want to put yourself through that? And hopping from city to city meeting the press and answering the same questions over and over? You didn’t get into writing to be a celebrity or to wax wise on literature or speak for other writers. Maybe you prefer to greet the public electronically from home, via e-mail or a blog. Indies can do or not do whatever they want—and accept the consequences, with only their own reticence or laziness to blame. So, you might ask, Smashwords or Kindle Direct Publishing? I published in both places: Smashwords for its distribution network and support, and Amazon for its cachet and accessibility. At the risk of sounding like a shill for Smashwords, I’m super impressed with their program. 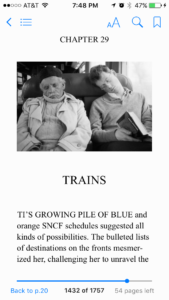 With one upload, my carefully formatted manuscript was converted into versions that could be read on Kindle readers, Apple devices, Nooks, or desktop computers. Within moments my book was shipped to iBooks, Barnes & Noble, subscription services like Scribd, library distributors, and a host of other “channels” of my choice. Even so, I went on to publish at Amazon because of the preponderance of Kindle owners out there, and the streamlined purchasing and downloading they’re accustomed to when ordering directly from Amazon. Plus, people know what you’re talking about when you say Amazon! Being an indie author doesn’t have to be a lonely, reinventing-the-wheel kind of existence. But it can be if you want it to—that’s the beauty of going your own way! My next step along the indie path will be to create a print version of New Old World. Not only will this new packaging reach a potentially different audience—those who refuse to give up the feel of a physical book in their hands—but it may send me on a different trajectory. With a pile of books that I’ve paid for, I may be more motivated to market my novel in order to recoup my expenses. And it may be an easier sell when there’s something tangible for people to look at and take home, with or without my autograph. As an indie print author, I will still have complete control over the look and distribution of my book, 100% of the profits will be mine, and best of all, I don’t have to wait for someone minding the publishing gates to decide whether my novel should be admitted to their realm. I’ll let readers judge. The new world of indie authordom is not fueled by profit, name recognition, or exclusivity—it’s a wide-open democracy for both writers and readers. And it has very little to do with vanity. And of course my novel, which you can get for free through July 2018 at Smashwords. Other retailers are listed in “Where to Buy” in the sidebar. I’m turning this post over to my readers, so they can tell you what they enjoyed about New Old World. Even though they’re mostly friends, their words were unsolicited and unscripted—just people speaking from the heart. Sharing these reviews might help you decide to read the novel or to formulate your own thoughts about it. Marketing can be really soul-sapping and riddled with self-doubt. So, words like these give me confidence and hope as I try to secure my first professional reviews. Thanks, readers! One nice feature of Smashwords is the self-interview that authors can add to their profiles. Smashwords provides default questions, but authors can make up their own, or do a mix. I chose to use primarily my own questions, because I wanted to discuss the way my life intertwines with the novel and to explain a few stylistic decisions I made while writing. It was a fun exercise and I’ve gotten some good feedback from folks who found it enjoyable to read and instructive. What motivated you to write New Old World? Why did it take you 25 years to write this novel? How did you decide on your cover? Why does the narration change from first to third person and include other voices? Who do you think will enjoy New Old World? You never know what’s going to happen when you give your e-book away. But within ten minutes of reducing my price on Smashwords from 75% off to FREE during “Read an EBook Week,” I’d made a “sale”…and a half-hour later I received an e-mail from the buyer! He hadn’t quite read my “magnum opus” yet (! ), but he’d already posted a flattering blurb on his blog under the title “2018 Overlooked Ebook Gems for $1 or Less on Smashwords.” You can see the post here, and I’ve provided a screen shot of his blurb below. The blogger is Robert Nagle and he’s not just a writer and a fan of literature, but a producer and promoter of e-books in this brave new world of digital content. I appreciated his post and hope to work more with people like this to get our books and businesses noticed. 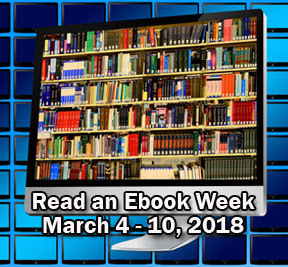 From March 4 to March 10, 2018, e-books all over the world are being discounted to encourage electronic reading—mine included! For just this week you can buy New Old World for $1.25 at Smashwords, a 75% discount from its usual $4.99. Here’s the link that goes straight to my novel, where you’ll see the price slashed. Just click on “Buy with Coupon,”download, and start reading! While you’re at Smashwords, don’t miss my new interview! Either scroll down past my profile on the New Old World page or go straight to the interview. Even though I knew I would be drawing heavily on my life for New Old World, I never considered writing it as a memoir. In my head, it was always a novel—because I love novels and wanted to try to write one, but also because I knew that my own life didn’t have all the dramatic turns that a good memoir needed. For most of my career I’ve been a non-fiction writer, in journalism, public relations, and business settings, so a memoir might have been more within my skill set. I’d already stretched the bounds of journalism with Faces of a Reservation by taking a fairly personal approach to my photographic and written portrait of the Warm Springs Reservation. And I wanted to stretch even more by creating fiction out of my own life. Like Ti in New Old World, I first planned to fictionalize my time on the reservation, but I was waylaid by life events, which agitated for a wholly different novel. I did finally start on the reservation novel about ten years ago in a largely futile attempt to move some material out of my page-heavy New Old World manuscript, but the “prequel” wanted to be its own thing and resisted these transfers. Now I have seven original but very tentative chapters sitting and waiting for me. Back when New Old World still bore the working title En Face de L’Eglise (Opposite the Church), I wrote an opening chapter that was an amusing riff on genre. In that throat-clearing essay (“Apologia”) I described all the possible genres that my book was not, maintaining that I just wanted it to be thought of as a Story, with a capital S. I’ll be reproducing this chapter for comic relief in an upcoming blog post. I realized even then that I was a bit torn about genres, but that I was also willing to play with them. As a result, New Old World is a kind of memoir-novel hybrid, a novel about someone writing a memoir. I suppose every novel narrated in the first person essentially is that, except Ticonderoga Fox has an acute awareness of her writing process, which creates an extra layer of story. The careful reader will see that part of this story-within-a-story is Ti’s desire to create more distance from her subject, as she gradually turns her memoir into a novel. New Old World is a bit like a 19th-century novel in the slow, expository way it presents Ti, her family constellation, and their history. One device of older novels is to have the central story be told by someone in a tavern or around a fire or at bedtime, with the author as listener. Ti is that storyteller within my novel, and while it may seem that she’s telling the story to herself, she clearly hopes that her son, and her elders, and her lovers are listening. Ti starts out intimately and nostalgically in the first person, but then with little warning the next three chapters are in the voices of two family members and a lover. Where did they come from? Ti invited them, in a way. She implies in her first chapter and in “Interlude” that she has drawn on the letters and memories of loved ones because it’s their story as much as hers. During the time covered by the early chapters, Ti wasn’t giving a lot of thought to her childhood or her relationships. She was raring to get on with her trip and not very interested in looking back. As the author, I saw this as an opportunity for her family and lover to introduce her and offer some backstory until such a time as Ti wanted to address those subjects herself. Much earlier, in my very first draft, I had made a similar decision about the final chapters, though “decision” isn’t the right word because it’s just the way the chapters flowed out. It had felt natural, after Ti’s climactic event, to tell the end of the story from the perspective of observers, as if their friend/daughter/niece/wife/ex had withdrawn first to heal and then to embrace her new life, unready to give her own account of those months and years. The opening chapters were always more elusive. After reworking them many times, usually in the first person and sometimes in a mixture of narrative and journal entries, I finally hit on the idea of other people laying Ti’s foundation and then getting her on the road. This gave me my final structure—the differently voiced chapters that bookend the novel. It was a late choice that felt right. Once Ti starts her cross-country road trip, it’s her story again, told in the first person, still in a kind of memoir style. But just before she’s ready to put herself on the plane to England, her real life intrudes: her baby has become a toddler and is not taking naps anymore, while her husband is going blind. It’s just not the right time to be writing a memoir! So she stashes it away and picks it up again—twelve years later. That’s the enigmatic “Zigzag” chapter, where it might seem that as the author, I am interjecting myself, but it’s really Ti moving away from and back to her own just-launched opus. If this chapter is difficult to sort out, just imagine the leap of faith that would have been required in my early drafts, when Ti actually gave the manuscript to her cousin James to finish! I clung to that device for years, but realized, with the help of a couple of volunteer readers and the one editor/advisor I hired in this whole process, that it was important to keep the manuscript in Ti’s hands during the heart of the story. It was a trust issue between author and reader. During the elapsed “down time,” Ti has come around to feeling some distance from her story. She has perspective now that she didn’t have when the events were so fresh, and she feels a natural urge to tell the story in the third person and in a more novelistic fashion. So as “Zigzag” moves along, she begins referring to herself in a mix of first and third person, trying to make a distinction between the old Ti and the new Ti, and preparing the reader for the next sections of the book, which are in the third person. While this sense of time and distance vaguely mirrors my own experience of working on the novel over three decades, I never put the manuscript down for more than a matter of months. In fact, my own son’s early school years were my most productive time, and before he’d finished elementary school, I had a complete first draft, which I’m not proud to say I’ve been tinkering with ever since! So now, in the “Old World” and “New World” sections, we’ve entered a third-person story that’s still very much inside Ti’s head, but with passages from other characters’ points of view as they become more important to the story. After the climax, the telling is handed back to friends and family in a long dénouement that sees Ti through a period of grief and rebirth—her new old world. We don’t hear directly from Ti again until the final poem, which adds some new information and gives a sense of circularity and completion to her story…a tale that has gone twenty years beyond her original scope. What kind of memoir has the narrator popping in and out of her story? What kind of novel shifts the narration from first to third person as well as voice to voice? Maybe the kind of novel-memoir hybrid written by a self-taught fiction writer who feels no compunction about breaking the few rules she knows. Since I write by instinct and then edit with slightly more of my left brain (but not as much as would be engaged in an MFA program), I can only say this with assurance: that New Old World is intended as a novel about a woman who believes she is writing a memoir, until she decides she’s not. As Ti’s alter ego and creator, it was my job to make sure she told her story as honestly and entertainingly as possible. That meant making my own life infinitely malleable, within the bounds of credibility and the conventions I created for that new life. By choosing to adhere to some aspects of my reality and to imagine others, I may have complicated matters for readers who know me. But I’ve also allowed myself to explore new, unfamiliar things like motherlessness and grief—issues that end up having more bearing on other women’s lives than on my own. By this definition, I believe my final version of New Old World is more a novel than it ever was in its 27-year-history. But it also reserves the right to be a memoir whenever it suits my protagonist and her story. Everyone has had the experience of reading a novel inspired more or less by the author’s life and wondering which elements are “real” and which are fiction. It’s an exercise that can lead you to a level of truth or lead you astray; it can enrich your reading experience or take you out of the author’s carefully constructed world. As a reader, I’m guilty of imagining autobiographical content even when it may not be there. How can an author not write about what she knows best? Even in the most fantastical fiction, the author is surely articulating her own experiences and opinions through her characters, be they axe murderers or aliens. But it’s probably because I have written so directly from my own life that I assume others do, too. It’s my literary comfort zone. As a newly published writer, though, I’m quite outside my comfort zone. After keeping New Old World under wraps for three decades, it’s exciting but also a bit of a shock to have my friends and family reading it and talking about it. I feel exposed, but not because the details of my life are on display—I’m generally pretty open about all that. My discomfort has more to do with the conundrum I unwittingly created for readers who know me well. Almost to a person they’ve reported being distracted by the task of unraveling me from my protagonist Ticonderoga Fox. Whether it’s an elective or an imposed task, it seems to have interfered with their immersion. My not very admirable first impulse is to apologize—for using my life as source material and then for tweaking it just enough to make it weirdly unfamiliar. The result is a hybrid Ti-Cynthia that I’ve unleashed on my friends and family. Those who have finished the book have been gracious and complimentary but also full of questions, which I try to take at face value and not as cloaked criticism. This is not to say that I haven’t enjoyed the various coffees and e-mail exchanges I’ve had with friends, where I’ve done some voluntary decoding, asked questions of my own, and reassured them that I’m still the same person they thought they knew before I messed with their minds. It’s more fun than I expected to talk about what I’ve written. A few readers have said they were “hooked” from the start because they enjoyed the quality of writing or found the family intrinsically interesting. But I need to pay attention to those who have reported that the momentum doesn’t really pick up until somewhere in England or France. Is that because they’re busy with the biographical sorting game? I’m heartened by people who made it to the end and said that the payoff is worth the early investment of time and effort. I’m also encouraged by a couple of readers who don’t know my past well and have had smoother sailing through the early chapters and beyond. It probably doesn’t help that I’ve consciously played with genre, using different voices, viewpoints, and narrative distances to blur the line between novel and memoir. I will write more about these choices and devices in my next post. In New Old World I’ve also introduced a family that has some parallels with my own, and then posed multiple “What ifs?”. For example, what if a woman grew up without a mother and that absence affected her life decisions, her relationships, and her thoughts about motherhood? What if she had a crisis while traveling that turned her life around and showed her how to deal with grief at last? They are intimate questions, not political ones, and the answers are personal, not dystopian. But, like Roth’s “What ifs,” they took me outside the limits of my life and served to address larger truths that might speak more universally than my own story could have. Roth anchored his speculative novel in the reality of his own family, then told a bigger story that not only had repercussions for that family, their neighborhood, and the nation, but continues to serve as a cautionary tale in these Trumpian times. 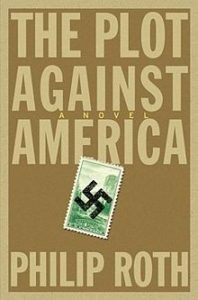 As far as I know, Roth was never apologetic about using his own familiar demographics as his starting point in this and any number of novels. So why is it difficult for me to admit that I’ve written a character so much like me and a story based on some of my own experiences? Is it the suspicion that an author, especially a woman and a first-time novelist, isn’t really being creative if she doesn’t invent a story out of whole cloth? It’s also tempting, as the world shudders under this newest populist surge, to dismiss a very personal story as not relevant or meaningful. I had gone into this project wanting to better understand a big transition in my life; but I never fully achieved that understanding because the novel took off in other directions, posing different questions with different answers. Would it have been more honest and perhaps instructive, to write a memoir instead of a novel and stick to the “facts”? In my mind, I didn’t need to choose between novel and memoir—I tapped my life and created something new. I knew my story needed something more than randomness to hold it together—it needed new contexts and a different climax in order to flower into an engaging work that would speak to other human beings on its own terms. So that’s what I did for the sake of a wider audience (commercial viability never having been a goal). I’ll stick my neck out here and submit that a semi-autobiographical novel should be viewed as total fiction if that is the author’s intention. But the author can’t simply label it a novel—she has to earn the right to that genre by telling her story both universally and specifically enough to keep readers in her dream. If they’re distracted by real-life similarities, perhaps there’s something else wrong, technically or stylistically. But before I jump to conclusions or start rewriting, I will wait patiently for input from strangers who bring to the book only the desire to be captivated by another stranger. It would be nice to have a professional critic weigh in, too. In the meantime, it may be useful for my readers, both strange and known, to think of New Old World as a puzzle. Not the riddle of who’s who or what’s real, but a series of interlocking story pieces that all fit together into a complete picture by the end. My hope is that readers can relax and have fun handling the individual pieces, no matter how much they look like me. I’ve been reading e-books for several years now, but it wasn’t until I started trying to format my own manuscript as an e-book that I truly learned the differences between print and digital versions. This may seem obvious to people familiar with designing e-books and websites—but to the average reader or writer, it’s a bit mysterious. The biggest difference is that an e-book document has no fixed pages; instead it flows like one continuous document, much like this blog. (Also kind of like Jack Kerouac’s manuscript for On the Road, though I saw that in person and it was actually a series of pages taped together into one scroll! See left.) Each e-book reader simulates pages that you can flip through, but of course those pages and their numbers change when you fiddle with the font size or switch from one device to another. So the job of the e-book formatter is to forget about standard page layouts, including margins, headers, and page numbers, and focus on the overall look and style of the text and chapter titles. The most important formatting commands you’ll issue are those telling the conversion software when there should be breaks in the scrolling for new chapters and sections. One of the handiest features of an e-book is the hyperlinked table of contents that allows the reader to jump to sections and chapters, much more efficient than an imprecise thumb cracking open a book or fanning pages. Creating the hyperlinks was the scariest thing to anticipate but turned out to be the easiest part of e-book formatting. I felt like I’d been let in on a magician’s secret! I was introduced to e-book formatting last year when I bought a “2Way” template from Book Design Templates online. My goal was to create an attractive internal book design for a very limited print edition that I planned to produce with our local Espresso Book Machine. It was a bonus for me, or so I thought, to be able to make an e-book version at the same time. But it turned out only to be a distraction as I had to disable some of the e-book features for the print version and kept stumbling over the template’s built-in formatting. I did ultimately produce a beautiful print book, but I never could get an acceptable e-book version, partly because of my own ignorance but also because of the conversion program recommended by Book Design Templates. I’m not discouraging anyone from using their templates—they’re good-looking, affordable, and relatively easy to use—but I believe you have better control if you do it yourself from scratch. So, this past fall, I started all over again with the e-book formatting. I had made quite a few changes to my original Word manuscript and my templates were out of date, so I decided to simply reformat the original. I had chosen Smashwords for my e-book conversion and distribution, and they prefer that you submit a Word document (.doc not .docx! ), so at least I was staying within the same program. And their Smashwords Style Guide is so clear and easy to follow that I knew I could do it myself. I won’t be going step by step through the formatting process—I’d end up reproducing the Smashwords Style Guide in order to cover everything, and you can check that out yourself. Instead I’ll hit a few high points. The Smashwords Holy Grail is an uploaded document that’s formatted as simply and elegantly as possible, with no ambiguous commands and using Word’s “paragraph styles” to precisely define the look and flow of the book. If you have any bad habits left over from the typewriter era—tabs, spacing over, multiple returns—they must be shed once and for all during this process! The original manuscript is to the left, with its page numbers and headers, and rather disorganized line returns, and the new formatting on the right, with cleaner chapter heads and more precise commands and some spacing built into the styles. The Find window shows that I’m searching not for specific words but for anything in italics, which would include my French, my postcards, and my letters. Note that the e-book document is single-spaced, which turns out differently on different e-readers. 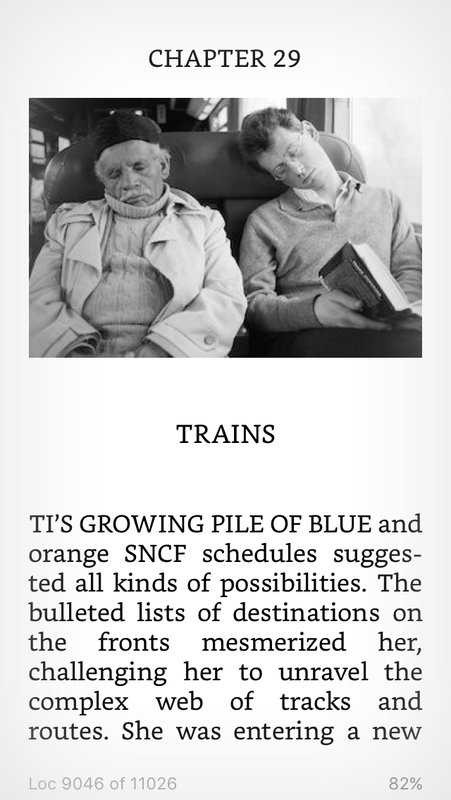 For instance, the Kindle version has tighter line spacing, which in my opinion looks clunkier than the iBooks version. The screenshots below are from my iPad—Kindle at left, iBooks to right. You can also see that the Meatgrinder (the Smashwords conversion program) has taken care of the justification of text…though I learned while collecting these various screenshots that the iBooks version on the iPhone is not justified—perhaps a readability issue for such short lines (see iPhone shots further down). 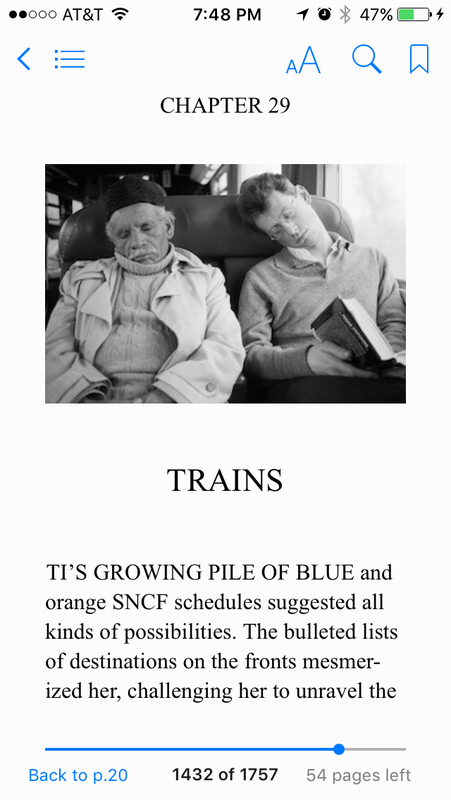 Probably the trickiest part of formatting an e-book is getting photographs and other graphics to display properly. You don’t have absolute control over how big they’ll show up, and each format deals with images differently. All you can do is make sure your photos are small enough not to put your document over the maximum upload size (10 MB for Smashwords) but big enough to be sharp and to approximate the look you want. I made all my photographs 320 pixels wide so they wouldn’t take up the whole screen width but also wouldn’t appear as postage stamps. When you figure in the differences among smart phone, tablet, and computer displays, you can see that it’s a hit-or-miss proposition. (Compare the iPhone images below, Kindle at left, iBooks at right, with the iPad screenshots above.) If anyone has any tips for keeping photos in relative proportion to the text, please share! As for the hyperlinked Table of Contents, I was delighted to discover how easy it was. In a nutshell, you insert a bookmark before your chapter title, give it a unique one-word name, then go back to the ToC you’ve already typed, highlight the equivalent chapter, go to Insert—Hyperlink, and anchor it to the bookmark. And that’s it! There can be glitches along the way, and I had a couple, but Smashwords helped resolve them. Throughout the formatting, I did a number of test conversions using a program that Book Design Templates introduced me to. It’s called Calibre, and it converts books into a host of digital formats. But I’ve learned that each converter has its quirks—for instance, Calibre can’t justify the text in an EPUB format to save its life, and the Meatgrinder at Smashwords has an odd habit of inserting blank pages between page breaks. Another bit of awkwardness is that Calibre only accepts .docx from Word while the Meatgrinder wants .doc, so I was constantly having to save in different versions for testing. But these trial runs with each converter gave me the general idea whether things were working, particularly with the hyperlinks and the photos. And when I had problems I just couldn’t puzzle out, a very kind and smart guy named Kevin at the Smashwords help desk looked at my document to see where the errors were, and/or ran my document through the Meatgrinder on a test basis. That way, before I officially uploaded it on “publishing day,” I knew that my document was clean and I was confident it would survive their “AutoVetter,” which identifies formatting errors. I can’t say enough about how helpful Smashwords was during the formatting. Since I wasn’t paying them upfront, I didn’t expect to have access to a help desk, much less someone like Kevin who could quickly diagnose my issues and test my fixes. But I’m not sure he or anyone else would have been as willing to help if I hadn’t demonstrated some proficiency in Word or familiarity with the Smashwords guidelines. Fair warning: this process is not for the unprepared or the faint of heart! 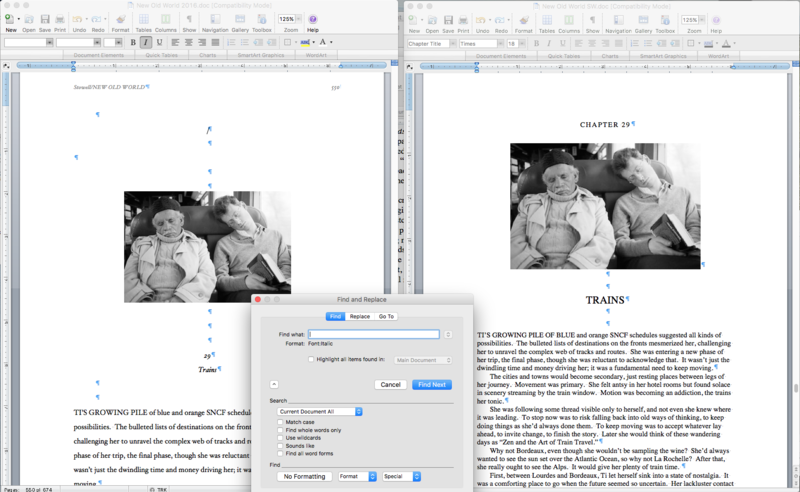 As I’ve said before, I’m a bit of a perfectionist, and it was hard while formatting my e-book to let go of some of the control I had when designing my print book. But it’s important to realize that the Meatgrinder at Smashwords is a generalist, having to come up with a product that works for the range of e-readers available, from iPads to iPhones to Kindles to Nooks. Kevin said that the Meatgrinder would be undergoing an upgrade soon to eliminate some of its idiosyncrasies, but in the meantime I think it did a remarkable job of turning my Word doc into a presentable, sometimes even attractive, e-book.